Are you in need of an experienced, professional writer? Then High Hopes Communications is the place to look. Brian has experience writing and editing magazines and newsletters, writing event reports, creating news and media releases, interviewing and writing personality profiles, business profiles and much more. Brian was the newsletter editor and web content creator for several not-for-profit organizations For two years he was the content coordinator and writer for Neighbours of Tuxedo and Neighbours of Linden Woods magazines. He currently writes business and community profiles for Transcona Views newspaper. Brian has done some work editing and promoting books for local authors and is writing blog and online content for several Winnipeg organizations. If you need an article written to promote or highlight your organization or promote a special event, or need a feature written about a series of events or people, High Hopes Communications can help. Brian can interview people for personality profiles and business profiles, attend and record special events, and help to highlight all the amazing things your company does. Do you need a writer/editor for your company newsletter, social media, or blog? Then High Hopes Communications can help. 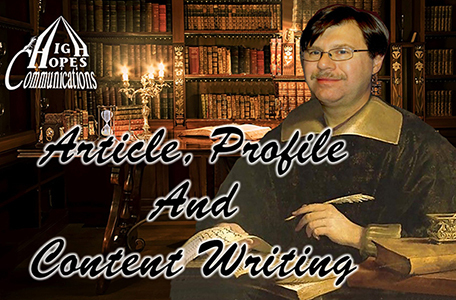 Brian can help with all your written content, both online and hard copy. Brian can either write the content for you, or organize, edit and format existing content to highlight your business to your customers, staff and associates. The bottom line is, if you need it written, Brian can help you. For all your written needs, come to High Hopes Communications to make your Communications Dreams Come True. March 2016 A Passion to G.R.O.W. October 2016 Dlux Design and Co.
Is Multitasking Always a Good Idea?